Have you ever wondered where plastic comes from, how plastic bottles are made, or where it goes when recycled? The students of Washington, DC public schools are learning the answers. 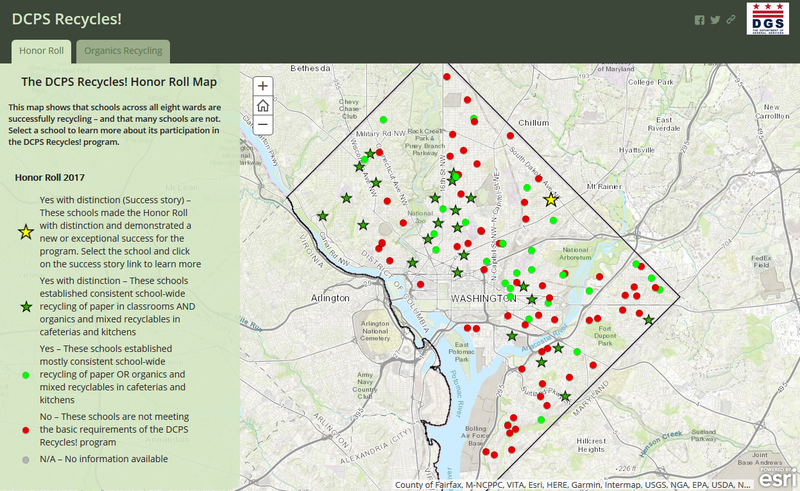 To celebrate America Recycles Day (November 15th), the Department of General Services (DGS) in Washington, D.C. is launching a brand new series of Story Maps focusing on some of the most commonly found items in a school cafeteria. The Story of Waste looks at how everyday items are produced, transported, consumed and recycled. The stories help teach students the global supply chain of products, where waste from their cafeteria goes, and what it becomes. Did you know that over 8 million metric tons of plastic enter our oceans each year? 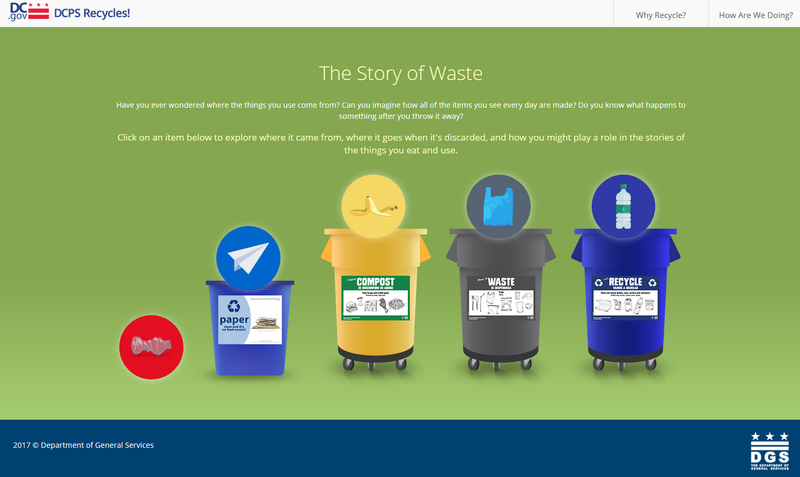 The stories also share statistics on waste to help students understand the importance and impact of recycling right. Narratives showing the recycle, waste and compost paths of a banana peel, plastic bag, and plastic bottle are complete. DGS and Blue Raster are working on additional stories for paper and incorrectly disposed plastic bottles, coming soon. DGS is working with over 100 public schools on programs for recycling and composting. In 2010 the city enacted the DC Healthy Schools Act which aims to improve health and wellness of students. Each year, schools are recognized for meeting the requirements of the program and an application was built to highlight Honor Roll schools on a map. Check out these great stories today!